Just regular folks. 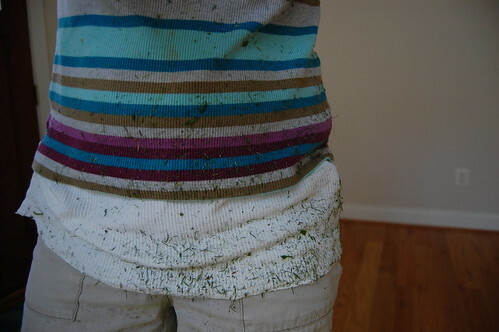 : Mowing the lawn. Even though we pay for super-duper Internet, we don't pay for cable TV - mainly because we are addicted enough to the Internet, we don't need another electronic opiate in the house. So I've missed out on American Idol, Gray's Anatomy and other things I don't even know about. I still follow celebrity gossip happily, but I often have no idea why the people I'm reading about are famous. However, I was hungering a bit for some Olympic action, so Jeremy went out and bought some rabbit ears, and I just can't believe the quality of broadcast digital TV. It's beautiful! Safety first. You should ware shoes all the time, preferably working shoes with steel plate in the front to protect toes. In addition, the gas tank should be stored in a locked place away from open flame with enough air circulation place. The plastic one is prefer. The metal one, when drop on the concrete, it can create spark and sometimes, it will ignite. No cell phone around gas tank, etc. Congrats on being a part of 10% of the population that does not have cable. We have never had cable and Josh is now 12. We used to have rabbit ears but no more Green Acres around here. We have two new HDTV's and got a high def antenna that Scott installed in the attic and it is great! Don't really care about cable except it makes the picture better. The antenna costs as much as one month of cable. Way back when, the rule for Josh was he could watch TV as long as there were no commercials during the shows - which meant only PBS. Sneaky on my part. Recently, I bought him an Itunes card at Target and he can watch Mythbusters or whatever I deem appropriate on his computer. It is not as current as Tv but that is not really that big of a deal. Way cheaper than cable and he can come and go to it when he wants. I LOVe the carnoival pictures especially the animals.